Below are two excerpt's from Alice Schroeders's The Snowball: Warren Buffett and the Business of Life, the first ever authorized biography of Buffett. In January 1943, following his father Howard Buffett’s election to Congress as a Republican representing Nebraska, the Buffetts moved to Virginia. The 12-year-old Warren had to change schools. Uprooted and unhappy, his grades suffered and his behaviour took a rapid turn for the worse. Bad grades were the least of Warren’s troubles in junior high. His parents didn’t know it, but their son had turned to a life of crime. “We’d just steal the place blind. We’d steal stuff for which we had no use. We’d steal golf bags and golf clubs. I walked out of the lower level where the sporting goods were, up the stairway to the street, carrying a golf bag and golf clubs, and the clubs were stolen, and so was the bag. I stole hundreds of golf balls.” They referred to their theft as “hooking”. Link to: Financial Times Excerpt Part One. 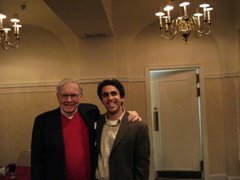 Early on the morning of Sunday August 18, 1991, Warren Buffett met John Gutfreund, Salomon’s outgoing chief executive, and Tom Strauss, shortly to stand down as its president, in one of the many conference rooms on the 45th floor of Salomon’s office downtown, just before the meeting at which the board would ratify Buffett’s apppointment as interim chairman. This was to be announced later that day. The board gathered outside. Suddenly, a lawyer appeared in the conference room where Buffett was meeting Gutfreund and Strauss, waving a message from the US Treasury Department. It was going to announce in a few minutes that Salomon was barred from bidding at Treasury bond auctions, both for customers and for its own account. All of them understood that in minutes Salomon would be shot in the head.